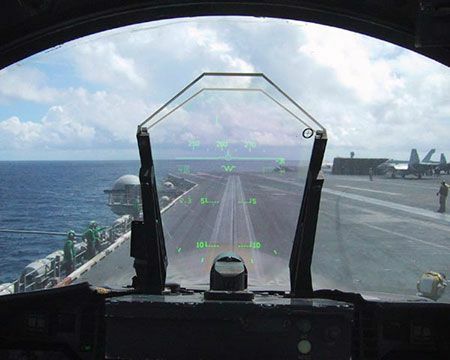 The head-up display (HUD) provides visual flight information to the pilot without requiring them to look away from the situations occurring outside the aircraft. The HUD improves the pilot’s situation awareness by putting important flight information directly in front of the pilot at canopy level. This keeps the pilot’s head up and not looking down into the cockpit. As the pilot looks forward during flight, the HUD displays details onto a transparent display about the engine, flight operation, fuel status, weapon status, landing gear, and flight surface settings. A standard HUD is comprised of a combiner glass (transparent display), a projector unit and a video generation computer (either integrated into the HUD or an external unit). Though originally purposed for military aircraft, HUDs are used in numerous commercial applications, as well. Duotech repairs a wide range of HUDs for several different aircraft, delivering under budget and within deadlines. Request a quote today.